The sun is shining, the birds are singing. All is right with the world…and it is my favourite day of the week. Waking up to the sun streaming in this morning and not my alarm going off at some crazy hour was the absolute best way to start the weekend. A close second? 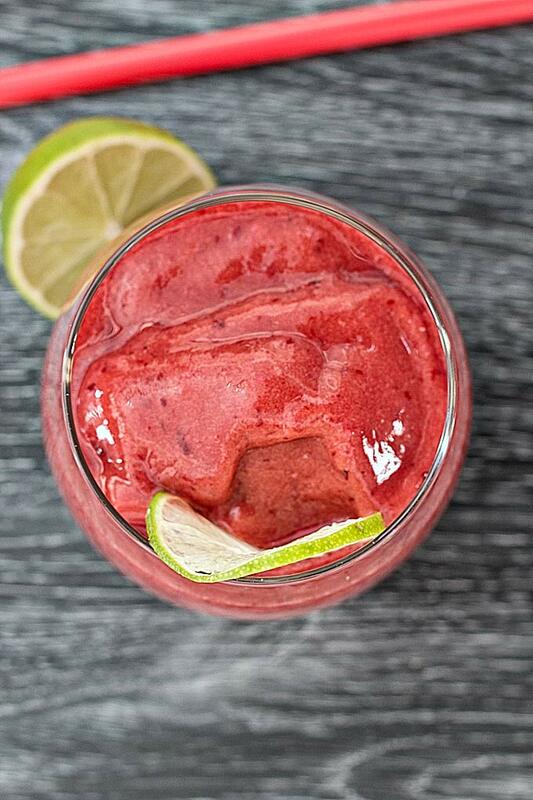 This tasty cherry peach limeade smoothie that is quickly becoming my new favourite smoothie flavour. 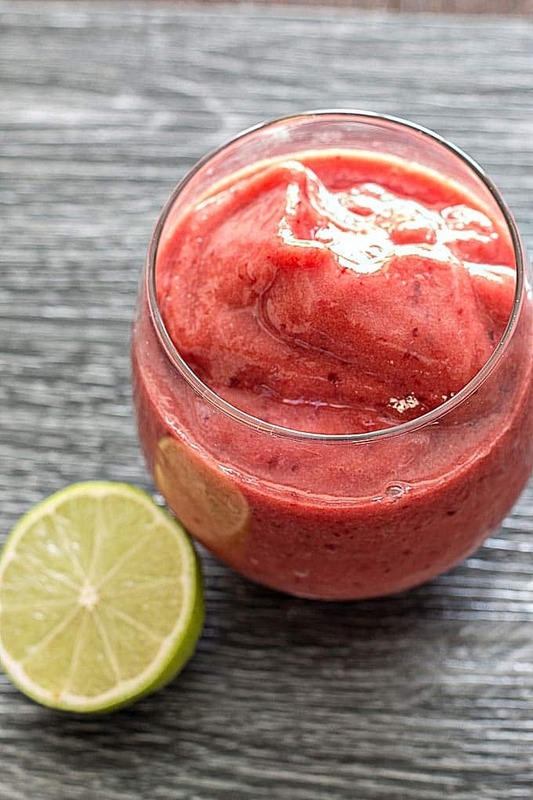 Simple smoothies are the best and this one totally fits the bill. No fuss and all the benefits. 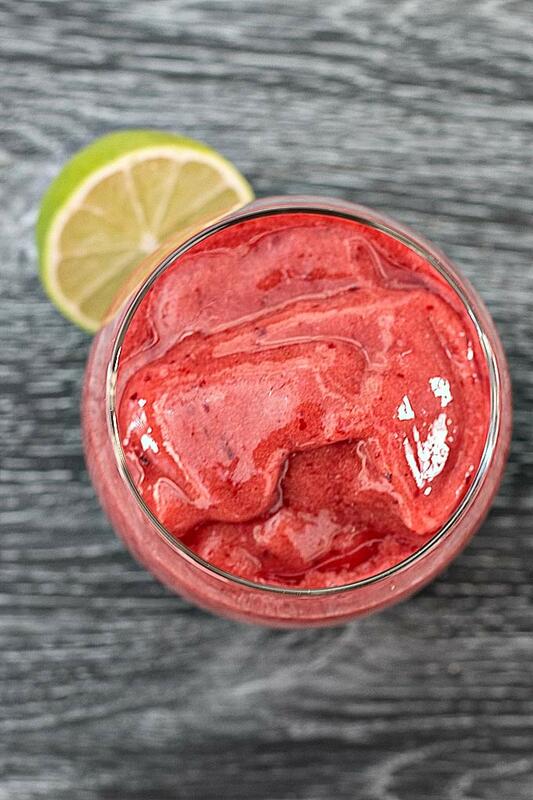 This is the kind of smoothie that you will be dreading the bottom of the glass and will be itching for the next time you can make it. Highly recommend making it in large batches our you might find yourself having to guard your glass and we all know that fending off potential smoothie stealers can be tough work. My little 8 year old smoothie stealer thinks she is being sneaky but little does she know that I make extra to account for her stolen sips…I have to do it this way because if I pour her own glass of smoothie it doesn’t hold the same appeal. I hope she doesn’t read this and figure me out! Limes are always a great addition to…well, just about everything. I love limes so much that I thought I’d try growing my own despite all of cards stacked against me. The biggest obstacle being that I live in Canada which is not exactly the best climate for growing lime fruit. The tree has survived two winters but I’ve yet to enjoy a lime from my garden. Maybe this will be the year that I have not only fresh mint in abundance but nice juicy limes too. Blend until all the ingredients are well blended and smooth. 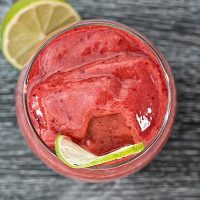 I use the Smoothie setting on my Vitamix blender. Thanks Shreya! Appreciate the kind words and I will check out your blog soon. Have a great day. This looks really good, but the frozen lemonade that you make is very tasty!!! Thanks Paige. I will make you one of these next time!